It should be obvious by now that there is a great deal of discontent in the "American Heartland". A very substantial portion of middle America has made it quite clear that they are dissatisfied with the political status quo, rejecting a mainstream candidate for president. 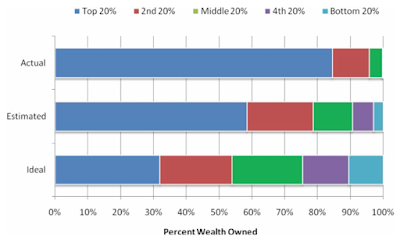 Looking at a brief paper by Michael Norton and Dan Iriely entitled "Building a Better America - One Wealth Quintile at a Time" provides us with a look at why this happened in 2016. 1.) a perfectly equal distribution of wealth. 2.) 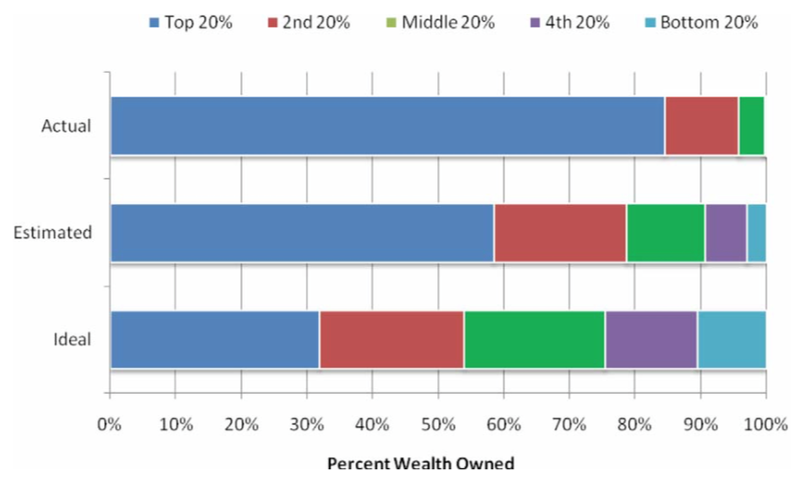 a distribution which reflected the actual wealth distribution in the United States. 3.) 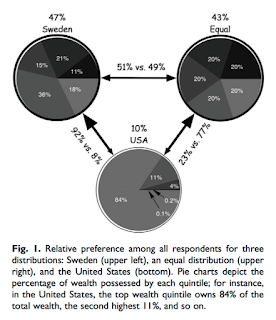 a distribution which fell between these two wealth distributions which actually reflected the real wealth distribution of Sweden. 1.) 92.7 percent of females and 90.6 percent of males preferred the Swedish wealth distribution to that of the United States. distribution to that of the United States. 3.) 92.1 percent of those with household incomes less than $50,000, 91.7 percent of those with household incomes between $50,001 and $100,000 and 89.1 percent of those with household incomes more than $100,000 preferred the Swedish wealth distribution to that of the United States. I was rather surprised that the Swedish wealth distribution was preferred given the distaste for all things "socialist" by most right-leaning Americans. It is amazing to see how, despite the reporting by the mainstream media about wealth inequality in the United States, Americans significantly underestimate the degree of wealth inequality in the United States. For example, respondents estimated that the wealthiest 20 percent of Americans control 59 percent of the nation's wealth when, in fact, they control 84 percent. When the respondents were asked to provide their ideal wealth distribution, they assigned 37 percent of the wealth for the top 20 percent, just under one-third of what they currently hold. What is fascinating about this study is that even the wealthiest of respondents felt that a more equitable distribution of wealth in the United States was desirable. 1.) Americans significantly underestimate the wealth disparity in the United States, suggesting that they are simply unaware of the gap. 2.) Americans hold overly optimistic views about social mobility in the United States which may be driving support for unequal wealth distribution since people feel that they have the chance to move up to a wealthier quintile. 3.) Disagreements about the causes of inequality prevent action being taken to reduce the problem. This study clearly demonstrates why there is such disenchantment in America's Heartland. With the gutting of the manufacturing sector and the oil industry and the hangover remaining from the Great Recession, the odds of "movin' on up, to the east side" (thanks to The Jeffersons) are becoming increasingly remote, leading directly to dissatisfaction with the political status quo. Sadly, what seems so obvious now, completely escaped the consciousness of the elite/literati in Washington (and, for that matter, the nation's centre of commerce in the State of New York). This became apparent with Hillary Clinton's comments about "the deplorables" who, in fact, have only one vote to cast just like all of America's wealthiest and they cast those votes against Ms. Clinton.